Marriott is partnering with PepsiCo premium bottled water company Lifewtr for an art project that uses augmented reality experiences. The AR project will be featured at a pop-up event taking place at The Oculus at the Westfield World Trade Center in New York on Dec. 5 and 6, and will continue to roll out for guests in Marriott Hotels nationwide throughout 2019. 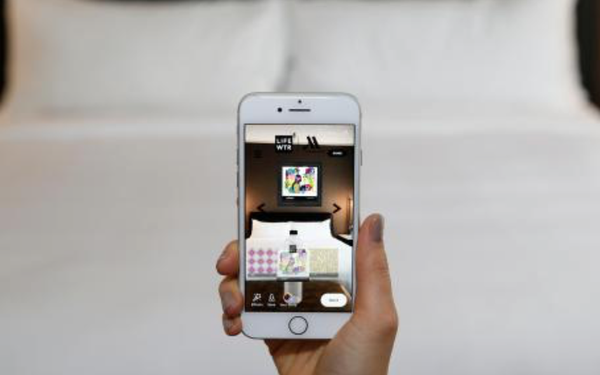 Guests can customize rooms virtually with an augmented reality gallery of artwork from emerging artists available on mobile devices. To start, guests scan a custom bottle tag on the Lifewtr bottles found in participating Marriott hotels, and then open the Facebook in-app camera. After choosing the artwork, they drag it onto the virtual walls. They can also color the artwork for an added level of personalization, and share the experience on social media within the app. “We are always looking for ways to engage and inspire our guests through innovative travel offerings, from the thoughtful design of our guest rooms to the enriching experiences we create with partners like Lifewtr,” said Matthew Carroll, vice president, global brand management for Marriott Hotels, in a release. Marriott International’s recently renewed its partnership with PepsiCo as the hotel chain’s soda-fountain supplier. The two partnered in 1991 after Marriott ended a 20-year relationship with Coca-Cola.